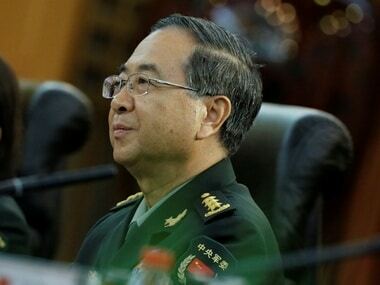 Beijing: China's former military chief General Fang Fenghui, who till recently headed the world's largest army, will be prosecuted for corruption, state media reported on Tuesday, becoming the latest top defence official to be netted in the anti-graft campaign launched by President Xi Jinping. Besides being head of the military till last year Gen Fang was a member of China's powerful Central Military Commission (CMC) headed by Xi. CMC is the overall high command of the 2.3 million-strong People's Liberation Army (PLA). He was under a cloud for sometime now. He was removed in August amid the 73-day Doka La standoff with India. Fang has been transferred to the military prosecution authority on suspicion of bribery, state-run Xinhua news agency reported on Tuesday. The transfer was made after the approval of the ruling Communist Party of China (CPC), the report said. Fang, 66, once the youngest commander of a PLA was described as an "opportunist" by military insiders, the Hong Kong-based South China Morning Post reported. Last November, his colleague Gen Zhang Yang, also a member of the CMC under Xi, committed suicide as he also faced an anti-graft probe. "Fang has close links to Zhang's superiors and subordinates because they were both proteges of disgraced former CMC vice-chairmen Guo Boxiong and Xu Caihou, with Fang being the most skillful opportunist, closely following Guo," the South China Morning Post report said. "The investigation of Fang was announced so late because of the sudden suicide of Zhang. In order to decrease the impact of Zhang's death to the army's morale, Fang's case was put aside a while until now," the Post quoted officials as saying. Guo and Xu, who were Vice Chairmen of the CMC under previous president Hu Jintao, were accused of heavy corruption including selling top posts of the PLA to the highest bidder. Guo, 75, was sentenced to life imprisonment in July last year and Xu died of cancer at the age of 72 in 2015 while in custody and under investigation for graft. Zhang killed himself as CMC decided to hold "talks" with Zhang to investigate his involvement in the cases of Guo and Xu, two corrupt former CMC vice chairmen on Aug. 28, a CMC statement said after his suicide. Both Zhang and Fang were taken in for questioning and later had been kept under house arrest, the sources added. "Both Fang and Zhang were allowed to return home because they were all heavyweights in the military. But all their close attendants, including drivers and personal secretaries, were replaced," the report said. "Both Guo and Xu were proxies of former president Jiang Zemin, with Fang, Zhang and other senior military officers their accomplices," a Guangzhou-based military official told the daily. "Actually, they were brought down by an internal political struggle ahead of the five-yearly party congress (in October)," another official said. Both the generals were replaced before last October's once-in-five-years CPC Congress which endorsed a second five-year term for Xi, who also heads the military and the party. Since Xi took power in 2014, over 40 top generals have been either punished or sacked for corruption and other violations, marking one of the major shakeups in PLA history in recent years. Critics say that the anti-graft campaign also helped Xi consolidate his power in the military and the party.